What? Did you think I was a burglar?! Well, maybe you should stop reading this and go check on your car? Is it locked? And while you’re out there, if you see another car cruising by late with a front passenger in the front clutching her cappuccino you’ll realise it’s not a local burglar by the zinc-bright branding: ‘Te Tira Arahi o Ōtaki’ / Ōtaki Community Patrol’. Getting ready for a patrol requires you to be alert and meticulous. No good lurching off into the night with a flat tyre or without telling Police Communications. Everything has to be checked and logged before starting. There might be specific tasks for our shift or there might not. We might be just slowly scanning the streets looking for anything or anyone that looks a bit suss, or out of place: a car parked at an odd angle with mismatching rego plates; a car crawling close to a kerb with a dog running alongside — so dangerous for both the driver and the dog — the orange glow of a fire in a rural back lot; a distressed resident looking for someone who wandered off in a wheelchair earlier in the night; a party spilling its aggro out on the street, the occasional horse loose from its moorings — shifts may be quiet in semi-rural Ōtaki but no two nights are ever the same. So what do we do? We’re not the police — no pepper spray, no taser, no Kevlar jackets and no authority to intervene in difficult situations. But we do have our clipboards, and our eyes and ears. And we use them. 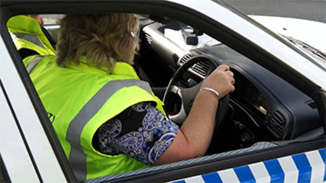 Volunteers are always need for the Patrol — enquire at the Ōtaki Police Station, corner of Iti and Matene Streets.